This spiritual dimension to consumerism is reflected in the nature of advertising which has come to say little about the advertised product but much about the identity attached to buying such a product. Buying a product becomes a means to attaining a particular identity or experience. In this process, the actual product is only instrumental and so we become detached from it. We like to romanticise our relationship with our produce, but our actions betray us as a nation that rewards size and doesn’t choose so much as follow. If we can’t go to a shopping centre without being hauled in by the duopoly – apples from Woolies, cereal from Coles, beer from Liquorland, wine from Dan Murphy’s, a hammer from Bunnings, shoes from Kmart, ink from Officeworks, a toy from Target, a pillow from Big W, petrol from Coles Express – then that is the power we have given these two companies. Steve, a Woolworths-contracted lettuce grower who does not want to be identified, is destroying more produce than he used to farm. The supermarket’s orders vary in volume, but Steve has to be ready to fill the largest one possible. He has duly increased the size of his farm. “I have to grow for the maximum size of an order, or else I lose the contract. So I grow on that scale even though the order is usually a lot less. Everything I don’t sell, I have to destroy.” While Steve’s contract with Woolworths gives him security, his margins are tiny and increasingly squeezed by rebates and marketing “kick-ins”. In June, he was one of the Woolworths suppliers asked for a “voluntary” contribution of 40 cents a crate – on top of a standard marketing payment of 2.5% of sales – to pay for a Jamie Oliver advertising campaign. “I didn’t like it, but I can’t afford to risk not paying,” Steve says. I’ve been roasting my own coffee beans for almost a year now. The procedure is very simple, and achieves the ideal of a high-quality product at far below the market cost. 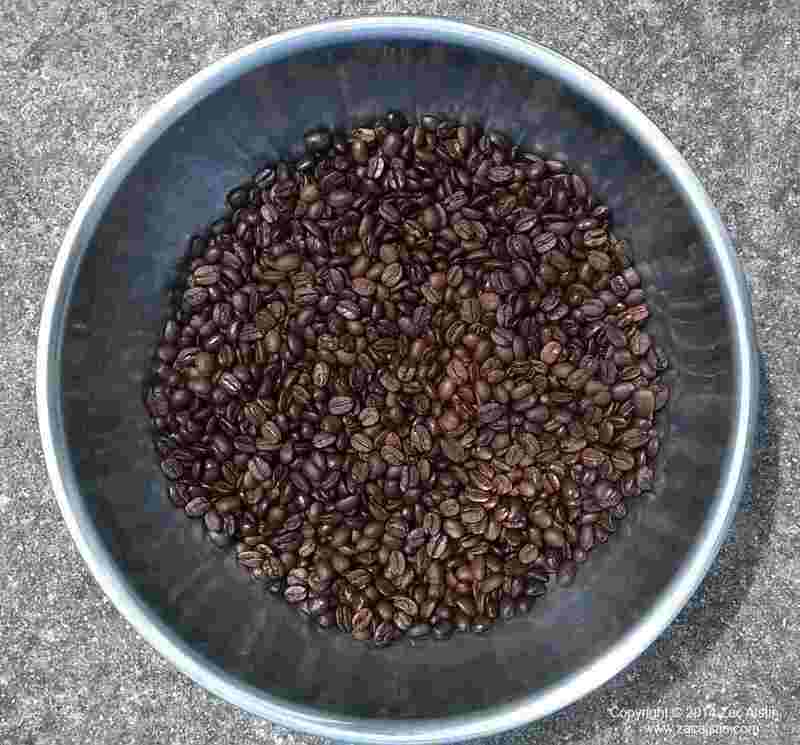 I can spend 30-45mins roasting beans once every week or two weeks, and enjoy the satisfaction, the freedom, and the existential high of producing my own great-tasting coffee. In practical terms I’m yet to find a downside to roasting my own coffee at home. It has become my favourite example of pushing back a little against a purely consumerist lifestyle, and producing something of value for one’s own benefit. It’s likewise an example of my broader theme of ‘richer on a lower income’, as my family moves slowly toward an improved quality of life on a much reduced income. How many other things could we produce – not for the sake of self-sufficiency, but for the sake of enjoying higher quality products without having to spend more hours in a meaningless job just to pay for them? How much autonomy could we regain by having in our own skills and possessions the ability to produce rather than merely consume? How much more fulfilling is a life spent cultivating the knowledge and sufficiency that past generations took for granted, and which we have all but abandoned? This tiny step of making (and then drinking) my own coffee is pure inspiration. It symbolises knowledge, freedom, power, wealth, and principle. It points the way to a better life in which we can break the ruling conventions of 9-5 jobs and supermarket trolleys. This isn’t about self-sufficiency in the most literal and demanding sense, nor are we about to dig a bomb-shelter, stockpile weapons, or form a fringe religious cult (coffee-cult, maybe). It fundamentally is not about making life more difficult, onerous, or weird. Rather, it’s about the kinds of improvements that would be common-sense if so many of us weren’t alienated and estranged by the demands of mainstream employment, and a culture increasingly dependent on a false dichotomy of career and consumption.